Support Please Live as we walk to fight suicide in the Out of the Darkness Harrisburg Walk. 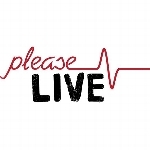 Please Live is a Pennsylvania based 501c3 nonprofit that focuses on education and awareness of youth mental health and suicide prevention through FREE educational programs provided to our community. In addition to providing help and hope to those who are hurting, one of our biggest beliefs is to support other orgs that are doing incredible work. That is why every year Please Live has put together a team for the annual Out of the Darkness Walk. AFSP's mission closely aligns with ours: to see an end to suicide. To this end, we are honored to walk with other like-minded indivduals in the community to support the work of AFSP and to bring the topic of suicide and mental health out of the darkness and into the light. ANYONE can join Please Live's team! To learn more about the work we do at Please Live, check out our website at www.pleaselive.org. Every year we design and sell team t-shirts for the OOTD walk. All funds raised through your fundraising portal will solely benefit the American Foundation for Suicide Prevention. However, if you would ALSO like to financially support Please Live, you may purchase one of our team t-shirts. T-shirt design will be unveiled soon and ordering information will be available on our website at www.pleaselive.org and on our facebook event page.